Celebrate Christmas with 9series Solutions and boost your business in 2018. Christmas, an auspicious festival where one loves to spend time with family and friends as well as want to make sure business remains uninterrupted. There are lots of Christmas offer around from ecommerce websites and local stores. You may find some best Christmas offers as well as some froud. 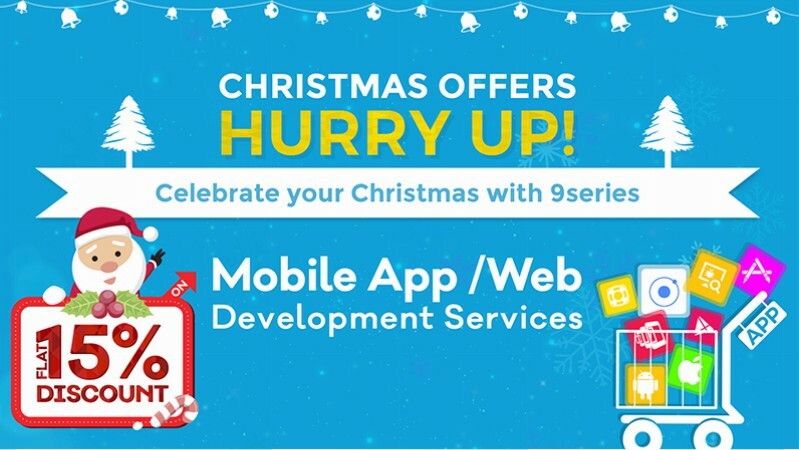 Here @9series, we have best christmas offers to you for your end to end mobile app development services and responsive website development services requirement. Whether you are having an existing mobile app, want to enhance it, add new features or upgrade it to next level with superior UI/UX, create a new mobile app POC/MVP for 2018 business plan, design mobile app wireframe for your new startup or want to create mobile app APIs or web portal. 9series is a perfect match for you and one of the top trusted mobile app development company in India. You can hire dedicated mobile app developers at 20% flat discount for 2018 from us. Average Christmas gift expenditure is expected to be 750 USD per customer. Evans Data Corporation estimated that there are 12 million mobile app developers worldwide. Statista says that the total number of mobile app downloads is going to be the whopping 197 billion in 2017. Average search for best Christmas offers and deals is 10 per day. Are you a startup? an entrepreneur? SMEs? Business Enterprise? Just like air, water and food, having a dedicated mobile application development services provider team necessary for most of the businesses who want to grow in near future by creating a strong digital presence with right use of tools and technology. Do you imagine your business without using technologies in 2018? Do you think of running your business without a trustworthy mobile app development company/partner in 2018? If you can’t then why don’t you grab an opportunity to start new year with an expert mobile app development team. At 9series, we don’t do mobile app development, but also bring lots of value that add 30% higher profit to your business. 9series will fulfill all your mobile app development requirements! We bring best Christmas offers to you and ensure your growth in 2018 by giving 15% flat discount on all your mobility related services. Hire dedicated iPhone developers and dedicated Android developers at 20% discount for year 2018. May Santa fulfill all your professional and personal aspiration and dreams in 2018. For more details get in touch with us at 9series !!! HTML tables have already come since long at the time of web. It may be surprising that some web designers have never worked with this element. In this article, our best graphics designers in India will discuss what you need to know about tables. We'll start with basic syntax and semantics. Then, we will attempt to respond to our tables. So, let's begin with this article in points of interest. 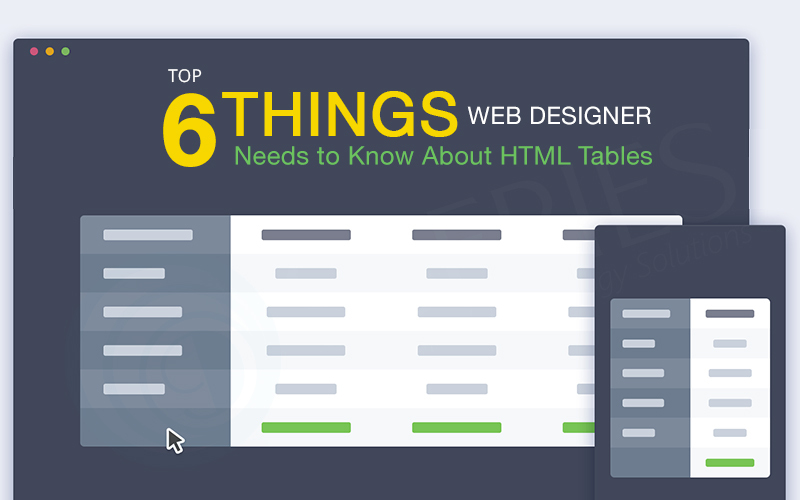 Which are the essential elements in each HTML table? You need a table, i.e. tr and td elements. Well, these are the elements that define the table. Next, tr allows you to define a row within a table. Finally, td defines a cell in the row, so the table element at the top level will be inside. There will be one or more tries and, within it, there will be one or more tds. Simply, you need at least markup to create this a substantial table. We all know that the web is increasingly turning into meaningful, not only about what you say but also how you can say. In other words, td is not the only one for the browser. Make sure, you can use some CSS to keep these two elements in style so that they look similar. However, the browser still realizes that these two elements are distinctive, semantic. It resembles h1 and p.
You can think about th as a similar for h1 or other heading and tr as a similar for p. Just like th, h1 adds more significance and weight, if you want, to the text. td is mainly a plain data for the table. This is why it is bold by default - it is more important You should always fill the rows (tr) with the same number of cells (td) or use colspan attribute with a specific number. Otherwise, the layout of the table won't seem as though you need. You can divide the table in thead, tbody and tfoot. These are only “tools” you can use to aggregate the content of the table in the more meaningful way and reduce potential mess. You can keep these table elements as head, body and footer. If you have decided to use these elements, there are things you ought to remember. All above three elements have two things in common. First is, they can not be vacant. If you decide to use any of these elements, must have at least one row (tr). Otherwise, the table will not be valid. In addition, in these components, the same number of the header (th) or data (td) table should be part of the table of cells. Or, you can already use the colspan feature from the above. The second thing is that these elements are normal, none of them will affect the layout of the table. As we have discussed, when you use td the browser will render the text as bold. 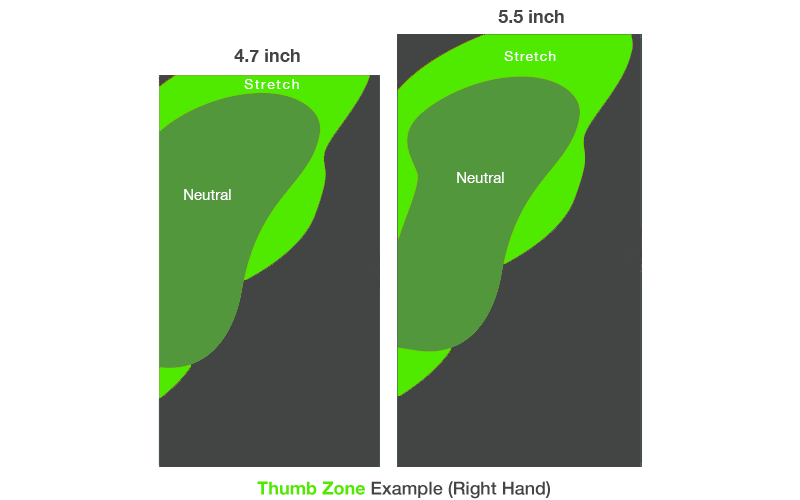 As long as you do not reset CSS stylesheet or other custom styles to override the default style or normalize, the reset stylesheet will look like td. Generic CSS will keep th bold. The same thing is true for thead, tbody and tfoot. None of them will change in the table in the browser. It's more plausible that you'll use thead and tbody, let's talk about this first. The tbody element is the choice of grouping the "standard" content of the table, Meaning, you can take all the rows (tr) with tds and put them inside the tbody. If you don't do anything, it will, however, be a substantial table. 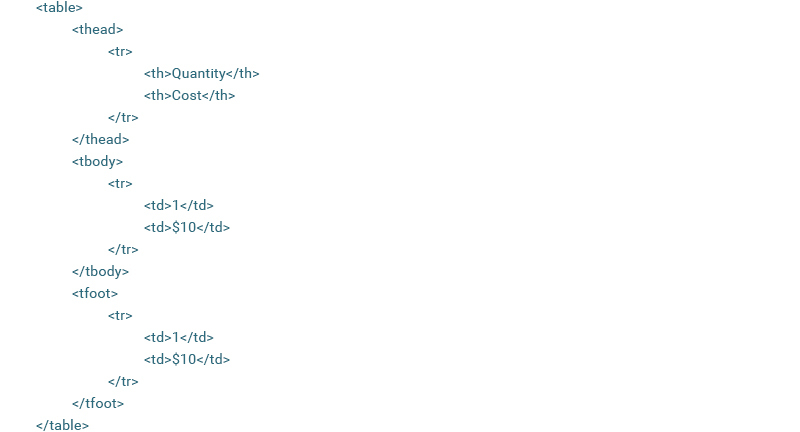 Like some text, HTML tables don't need to be either heading or thead / th. It can be just the metaphorical pile of rows (tr) and cells (td). Coming on the next list it is thead. Likewise to its kin, it’s also composed of one or more rows (tr). And, these rows can also contain standard table cells (td), with table headings (th). You can use both types of cells, th, and td, and your table will be perfectly valid. You want to use thead to add headings to columns. In that case, th makes more sense. Otherwise, you could as well ditch the thead completely and put everything in the tbody. Or, you can ditch both, thead and tbody. If you want you can put td elements inside thead. One thing to remember is that the thead element should be prior to any tbody or thead element. The last element you can use in HTML tables is tfoot. It should have at least one table row (tr) with at least one table cell (td). No, unfortunately, there is no special table cell, such as “tf”, dedicated only to tfoot. The question is when to use this element? It is a good option if you need to demonstrate some synopsis for every section of the table. The fastest and most commonly used solution is manageable. 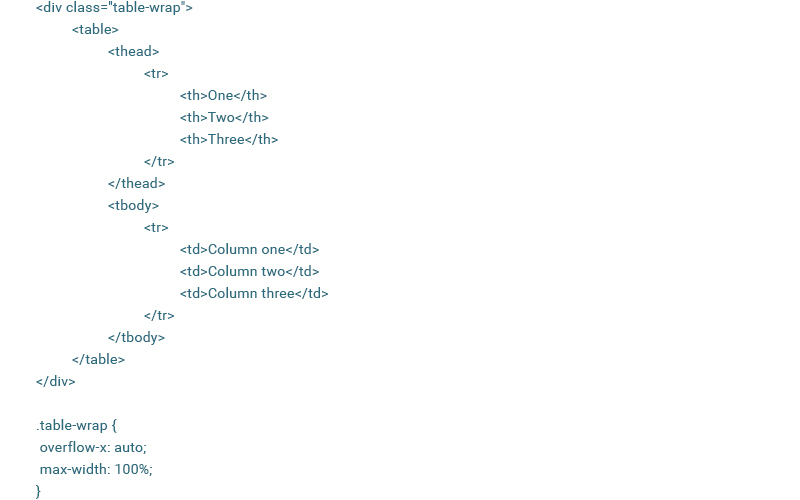 Instead of breaking the table with dozens of CSS lines somehow, you can wrap it inside a div. Then, you add two lines of CSS, set the "auto" to overflow-x (horizontal) on the first line and set the maximum width to "100%" on the second line. Table Wrapper will never overlap. At any time it will be narrower than the table, the horizontal scrollbar will appear. It will not let it overlap the table. Let's go through another possible solution for creating HTML table responsive. You can use CSS to hide specific columns to ensure that it matches the table layout. Here are some "unnecessary" columns in your table that you can hide. You have two options. First, you can use the previous scroll-based solution. The second option is first you will wrap the table inside a div with a small CSS twitch. Next, you'll hide some columns. Finally, you can add some buttons so that the user can "toggle" those columns. As a result, when the screen becomes too narrow, the table becomes smaller by hiding some columns. The scrollbar will not appear, as long as the user does not click the button. From that point forward, the columns will appear and the table will scroll. Responsive website designers in India offer services to make your website compatible in such a way that they respond to the users devices, platforms and screen size. For this article, we have discussed essential things that are related to HTML tables, which are mythological stories from basic syntax, semantics and responsive design. However, hope that this article gives you content that you need to start creating legitimate tables. Last words? Well, two. First, the tables are valid. Secondly, do not use HTML tables for layout, it's only utilized for data. 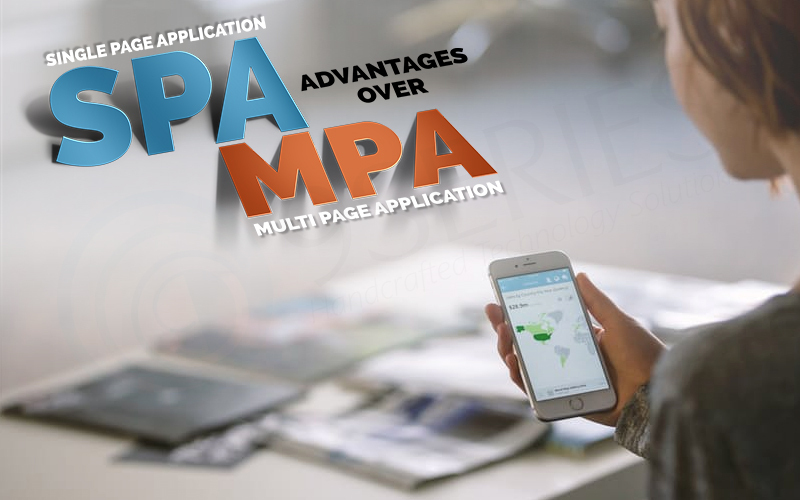 Single-Page Applications (SPAs) are Web apps that heap an individual HTML page and progressively redesign that page as the user communicates with the app. It is also known as Single page application. Microsoft’s MSDN informed us that SPAs use AJAX and HTML5 to create fluid and responsive web apps, without constant page reloads. On traditional websites, when visitors click on the links, these links generally lead to a new URL and load an entirely new page. In SPAs, the whole page doesn’t reload; instead, certain content is changed, loaded, and swapped out within the same page. 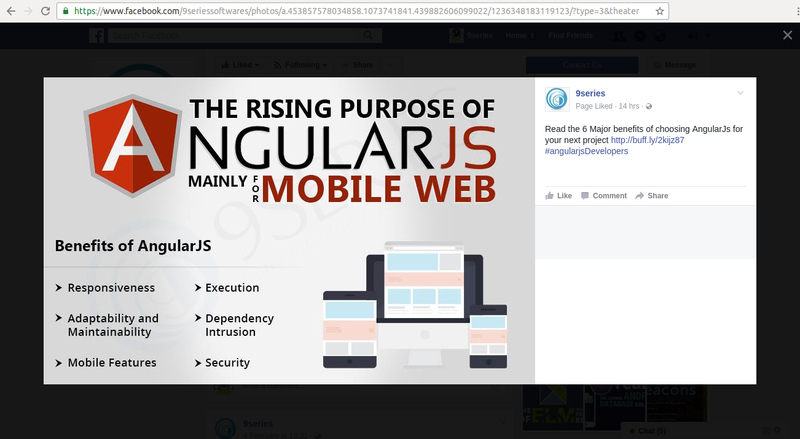 One of the best examples is Facebook : It is almost a SPA - most interactions don't require loading a new webpage. One example where it still happens is clicking on "Photos" section in the left side menu. It does send your browser to a new URL. I believe facebook engineers are managed in the direction of excluding these counter-examples and delivering real SPA experience. Let's have a look at the below example. 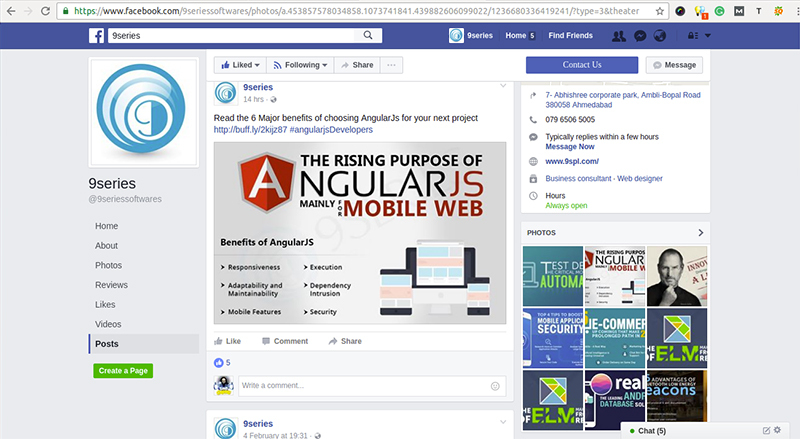 In above image, the page you can see is mainly the profile page of FB. Just note down the URL. On clicking any of the particular photos, the below image will appear. In above image, we can see that URL is changed but page remains same which is actually a true example of SPA. SPA is practically similar to client-server technology, where HTML page is static & all dynamic changes happen in the browser. In prior PHP, JSP, ASP, HTML was combined with server-side logic and it was created on the server. The server needs to process more load. With SPA we don't need to use additional queries to the server to download pages. SPA separates UI and data, SPA communicates with the server only with JSON REST API (Send/Receive JSON using AJAX), this likewise permits both parts to be autonomously developed and tested. You can simply fake JSON data interaction to test SPA, and you can likewise effortlessly fake JSON requests to the server to compose unit tests. SPA is rapid, as most resources HTML + CSS + Scripts are only stacked once, throughout the lifespan of the application, just data is transmitted back and forth. (Decreasing bandwidth usage is also a plus). SPA can use caching and local storage completely. It is simple to scale, and it is simple to cache resources. SPA works and seems more like an application than a web page. Back button issue, for the most part, all correspondence is performed using AJAX promises, back page failure is not an issue. In HTTP Post operation, failure on the server side would mostly expect to redo entire data entry. You would loose back button and unplanned route on different pages would result in redo the data entry. These issues can be resolved very well. SPAs are simple to debug with Chrome, as you can screen network operations, examine page elements and data associated with it. It’s simpler to make a mobile app because the developer can reprocess the same backend code for web application and native mobile application. SPA is less secure. Due to Cross-Site Scripting (XSS), it allows attackers to insert client-side scripts into web application by different users. SEO (search engine optimization) indications; since your pages are inherent in the browser, the search engine crawler will see an alternate version of the page than that of your users. Interpreted Mobile Development: You can reuse the same backend for web application and native mobile application. Easy Navigation Path: There is no real way to get lost on a single page website since there is no other approach to get info like scrolling down the page. Limited Amount of Bandwidth: Multi-page website takes a longer time to load. It still influences user experience. Single-page website needs limited amount of bandwidth than multi-page. Enhanced Mobile-Friendliness: Single-page websites are much less demanding to transform into rapid loading responsive websites since it simply requires less time. No complicated navigation or extra bells and whistles make this task an easy thing. It takes a lot of efforts to build a mobile version of a multi-page website. Of course, responsive websites are not restricted in a number of pages. 9series is among leading and fast-growing open source PHP development companies in India, mastering in developing stunning native apps to awe-inspiring cross-platform apps giving innovation yet another dimension. Our main focused services are Mobile app development, Website & Web app development. Adaptive vs. 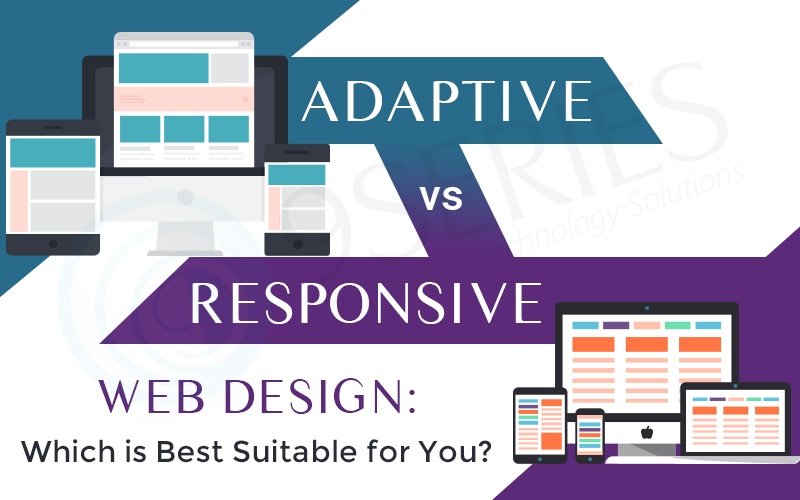 Responsive Web Design: Which is Best Suitable for You? The world of web design has changed significantly over the years and continues to emerge as mobile-friendly design becomes more about the law rather than the exception. When it comes to choosing the right design for your website, 9series keeps in mind the number of aspects to choose along with style, typography, imagery, UI/UX, performance and online appraisement just to name a few. Sites were created with fixed dimensions and were intended to be seen on a desktop screen only. 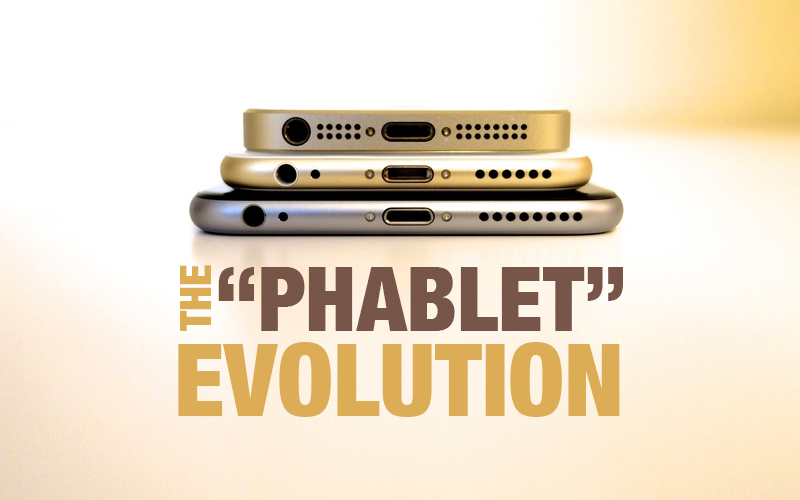 Now there are variations based on this original idea to make room for the arrival of mobile users. 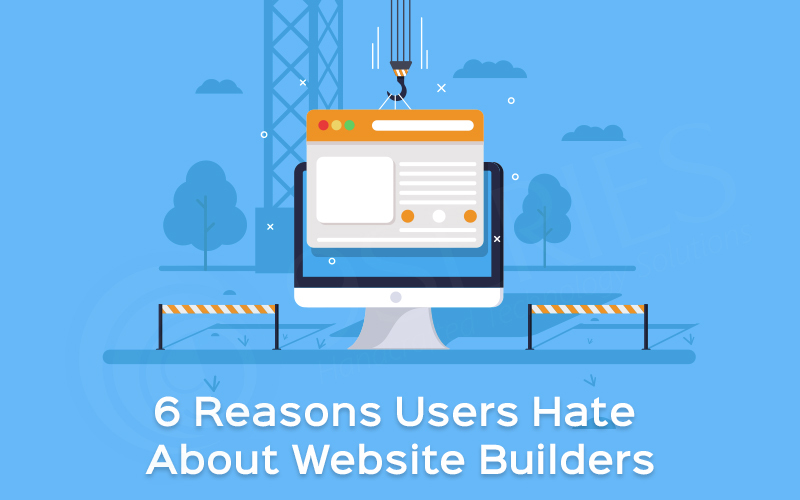 Your users are demanding to view your site - not only on a computer screen - but on a tablet or a mobile phone. As a result, two popular identifications for web page design are introduced and they are responsive & adaptive design. While each of these web designs have similar features, they each have their sets of pros and cons. Both responsive and adaptive design attempts to improve the UI/UX across variant devices, adjusting for variant resolutions, usage contexts, viewport sizes etc. The difference between responsive and adaptive design go towards spotlights for both website and application designers. Choosing with penetration can allow you to plan and execute your designs with better aim, purpose and results. Responsive is liquefied and meets the extent of the screen no matter what the target device is. Responsive website developers uses CSS media queries to change styles based on the target device such as display width, height, type etc., and only one of these is necessary for the site to fit to variant screens. Adaptive uses fixed design based on breakpoints which don’t respond once they’re at first loaded. Adaptive works to catch up the screen size and load the appropriate design for it – generally you would design an adaptive website for six common screen widths: 320,480,760,960,1200 & 1600. it appears that adaptive needs more work as you have to design for a minimum of six widths. However, responsive can be more complicated as the unsuitable use of media queries (or surely not applying them at all) can make for display and performance issues. Adaptive design is more like the latest implication of progressive enhancement. Instead of one flexible design, adaptive design detects the device and other features, and then provides the appropriate feature and design based on a predefined set of viewport sizes and other attributes. Adaptive is beneficial for retrofitting an existing site in order to make it more mobile friendly. This confirms you to take charge of the design and development for particular, multiple viewports. Generally, you would begin by designing for a low-resolution viewport and work your way up to make sure that the design doesn’t become unsound by the content. As specified already, it’s a standard design for six resolutions. 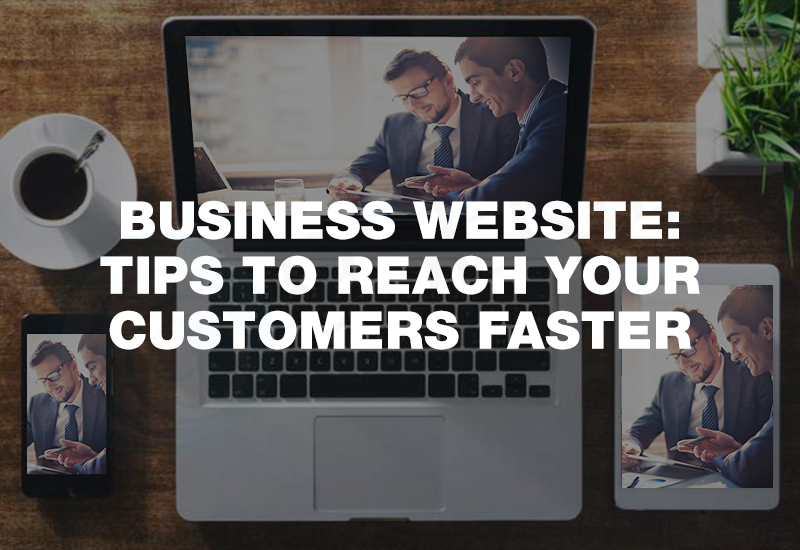 However, you can make a more informed decision by viewing at your web analytics for the most generally used devices and then designing for those viewports. If you want to design an adaptive site from scratch, then that is OK as well. Start again by designing for the lowest resolution and work your move upwards. You can then use media queries to expand the design for higher resolution viewports. However, if you prepare a design for multiple resolutions, you may find that this causes the design to ‘jump’ when resizing a window. It can be an additional work designing and developing a site with adaptive for multiple viewports so it’s usually used for retrofitting. Responsive design works on the principle of Elasticity of demand - a single fluid website that can look good on any device. Responsive websites use media queries, flexible grids, and responsive images to create a UI/UX that flexes and changes based on a bunch of factors. 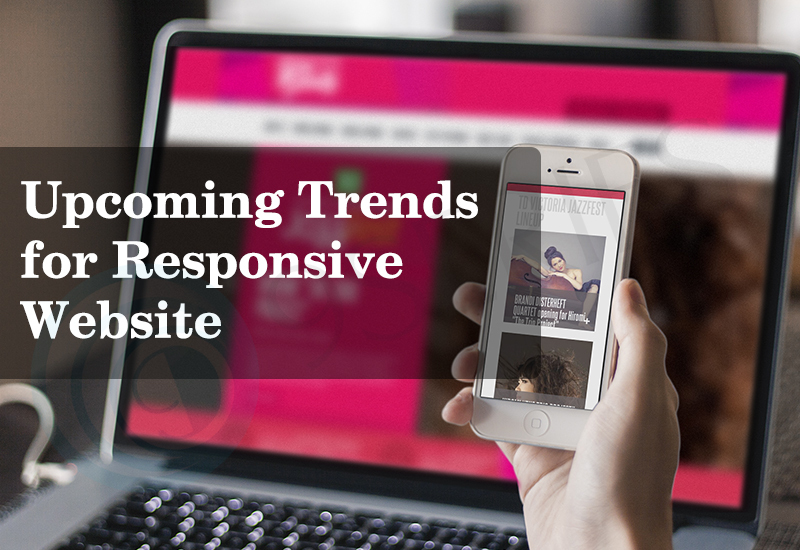 Responsive has a different structure and design of the website that targets a certain device. (it’s about a server side work because it’s all about different structure and different functionality). The majority of new websites now use responsive, which has been made simpler for shorter experienced designers and developers, thanks to the availability of themes that are accessible through CMS systems such as WordPress, Joomla and Drupal. Many times responsive web design doesn’t offer as much control as adaptive, but takes much less work to both build & maintain. Responsive website developers have their designs also in fluid and whilst adaptive can and does use percentage to give a more fluid feel when scaling, these can again cause a jump when a window is resized. For example, in the image below, which shows a fluid design, the designer is using percentage widths so that the view will be adjusted for each user. Sometimes simple terms can represent complicated concepts, so let’s try not to get confused. There are no shortcuts to whichever web design technique you decide to use both require work that comes with creating a site that’s fundamentally one-size-fits-all. It could solicit that Responsive doesn’t give the designer as much control as Adaptive, but generally requires less rework to both build, sustain and modify as needed. If neither of these sound right for you or you would ideally combine these two methods: why not try Re-adaptive web design! Whatever you decide, consider incorporating it into the early stages of the design process, for example, the prototyping stage, so that you can really test it out before making the final end product. Simplification of content : Another trend is the simplification of content. Responsive Web Design is by default mobile friendly and mobile users are looking for particular content. Using clear and simple content, easy to browse and searching will make a site not only mobile friendly but, will also enhance the user's overall browsing experience.